(Pizza Express Dean Steet, 17th September 2016 - Sounds of Denmark Festival. They might modestly resist it, but you could call Phronesis a ‘super-trio’, given their current stature on the European jazz scene. So it was a rare opportunity to see them in the intimacy of the Pizza Express Jazz Club in Soho, where they were playing as part of the Sounds of Denmark Festival. Bassist Jasper Høiby, willowy and wry as ever, joked that whilst they are a ‘Danish band’ today, they would happily be a ‘British band’ tomorrow if it was to their advantage. 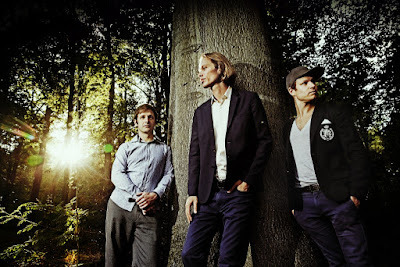 There is something undeniably Scandinavian about Phronesis’ sound though. Since their formation in 2005 they have lifted off from the Esbjörn Svensson Trio launch pad into their own unique orbit. On opener 67000 MPH from latest album Parallax, the band set serpentine lead lines against hefty grooves, yet avoided any sense of clutter; the arrangements as ordered as a Danish designer’s desk. Phronesis’ relationship with time is Professor Hawking level complex. Working out the time signatures of their pieces could be a fiendish new element of the music theory syllabus, or perhaps a high concept replacement for the intros round on Never Mind the Buzzcocks (very best of luck to Phill Jupitus and Noel Fielding!). This could all end up sounding like a technical exercise but an undeniable emotional element prevents that. It is elusive but might be found somewhere between Høiby’s playful flourishes, pianist Ivo Neame’s melodious voicings, and drummer Anton Eger’s exuberant musicality. Saxophonist Julian Argüelles made the trio a quartet for most of the second set. His presence loosened the group up, allowing the musicians to appear as individuals instead of aspects of the groove organism that is Phronesis. Instantly the group became more the ‘British Band’ that Høiby had joked about earlier, finding creativity in indiscipline, in the spirit of Argüelles' old gig Loose Tubes. Whether Phronesis are the sound of Denmark, Sweden, the U.K or anywhere else; they must be heard.